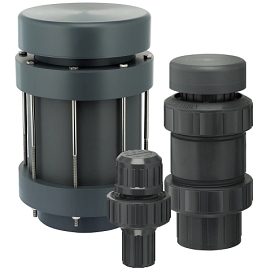 Vacuum Breakers – Plast-O-Matic Valves, Inc.
Series VB/VBM Patented diaphragm design assures dependable, repetitive, bubble-tight sealing to protect enclosed tanks from collapse or structural damage during draining. Also eliminates siphoning of dangerous fluids,and prevents vacuum damage to sensitive instruments and filters. 1/2″, 3/4″ and 1″ in a wide range of materials and connection types. Series VBS PFA encapsulated spring and special poppet provide performance identical to VB/VBM with same protection for tanks and piping systems against hazards, damage and financial losses caused by unwanted vacuum conditions. 1-1/2″ to 4″ sizes in a wide range of materials and connection types.